Hey there, Laura here today with a fun Valentine’s Day banner project for you. I love to make banners! I have one for every holiday and season. I have several places in my home where I hang them up to decorate – on my bookshelf, my pallet shelves, and above the window. If I had a fireplace, I am sure I would have a banner on the mantel as well! The banner punch board is one of my favorite tools because you can put together a banner quickly and easily. To create this Valentine’s Day banner, I started by making some red wire hearts using the Happy Jig. I used the size of the hearts to determine the size of my banner pieces. I cut white shimmer textured cardstock to 4” wide by 4 ½” tall for each banner piece. The way I make sure each banner piece is the same length, is I first use my paper trimmer to cut the banner piece to the correct width. Then, I use the banner punch board to cut my banner shape. Lastly, I use the trimmer to cut the length the same for each piece. I attached each of the wire hearts with washi tape. This allowed me to attach the hearts to the banner pieces, but also hold together the wire where the ends meet. Next, I created more flag banner pieces using patterned paper from Crate Paper’s new La La Love collection. I used the mini alphabet punch board to spell out the word LOVE. I attached the letters to my patterned paper using foam adhesive squares. Then, I added some heart sticker Thickers to each letter. To assemble the banner together, I used red and white baker’s twine. I tied each piece together making a little bow. This banner is so festive and fun. I love the mix of wire hearts and paper. This Valentine’s Day banner looks so cute on my pallet shelves gallery wall. Do you make a banner for each holiday? Hey there! Looking for a quality treat to share with your kids this Valentine’s Day? It’s Rebecca with you today and this fun project has a little something for everyone. I was looking for a way to do something special with my 8- and 5-year-olds, that wasn’t store-bought, but was disguised as a new surprise every day from February 1st through February 14th. I came up with the idea for a Valentine countdown, and while we’re only a couple of days in at the time of this writing, it’s been a big hit already! 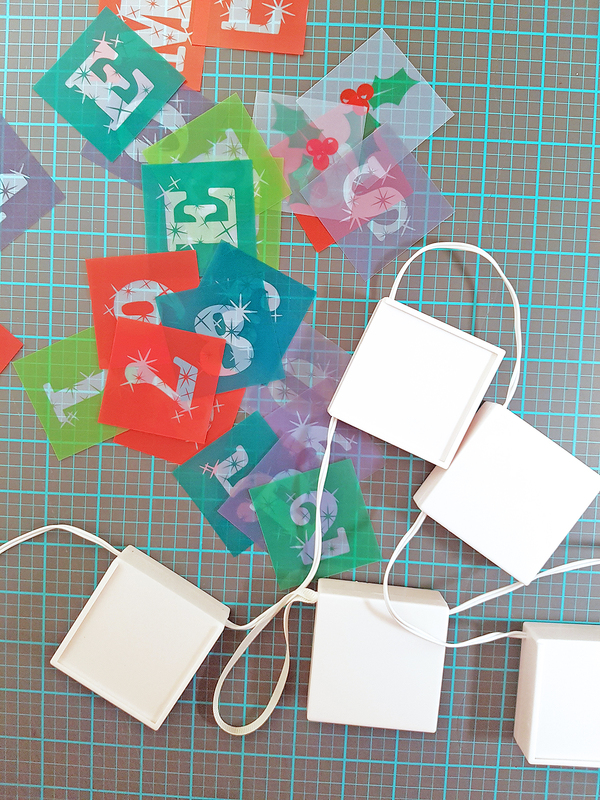 I began by using my Mini Envelope Punch Board to create 14 small envelopes. They are sized to fit 2 1/2″ x 3″ cards, and I made them with an assortment of patterned papers from Crate Paper. Each envelope only uses a 4 1/2″ square of paper and the mini punch board is so easy to use, creating them only took about 10 or 15 minutes. After making and assembling those, I trimmed white card stock to make flat cards to put inside them. I already know the kids will get enough candy in school, and they really don’t need any more toys so soon after Christmas. Instead, on each card, I wrote out an activity we can do as a family that day. We can play a game, go to the park, go on a hike or a bike ride, make cookies; just as long as we’re doing it together. My kids are young enough that they still love it when we can play with them and are very disappointed if we can’t due to work, house cleaning, or meal-making. So far, they’ve been enjoying opening these treats! Once I had all the cards tucked snugly inside their envelopes, I dressed them up a bit. I wanted to keep them simple but still fun and enticing, so a band of ruffled crepe paper tied on with twine was an easy way to secure the envelope closed; the band just slides off for easy opening. An adorable mix of Valentine stickers from Pebbles are so perfect for young boys or girls and add the perfect finishing touch! Next, I had an idea to display them on wired hearts, thanks to the new Big Happy Jig. While there is a double heart pattern found in the accompanying booklet, it wasn’t quite large enough to hold all 14 valentines so I had to come up with my own. I loosely used the heart pattern that goes with the original Happy Jig as a guide and figured out how to make it a lot bigger! *If you want to follow my pattern, you’ll need 35″ of wire. You can use the above photo as guidance. Luckily a heart isn’t too difficult to figure out so I created 2 of them using some of the thick red wire. I hung the hearts on a closet door with fishing line (Gus’s is on top because he’s taller) and attached each envelope to the corresponding heart with a mini clothespin. It’s a fun family activity, and cute Valentine’s Day decor all in one! Tip: You can change up this project by excluding the wired hearts and hanging the envelopes on twine as a garland or display them in a basket. These would also make cute school valentines. If you love the idea of the wired heart, be sure to save it for next year and repeat the Valentine countdown! Valentine’s Day doesn’t have to be all about candy and gifts (though I’m secretly hoping for a box of chocolates ;). You can sneak a little memory-making into it, too, and I bet your family will love that just as much! Hi there We R friends! It’s Aly here on this lovely Monday morning sharing some Big Happy Jig inspiration with you. I’ve noticed a lot of large wire handlettering in home decor, wedding decor, and event decor on the interwebs lately, so when I saw the Big Happy Jig was coming soon I was so excited to DIY that cool look and incoporate it into my own home! Check out what I made with the new Big Happy Jig! I’ve wanted to make a hoop wreath for a while now, and the large scale wire handlettering possible with the Big Happy Jig lends itself perfectly to this trend. The Big Happy Jig works just like the smaller size Happy Jig, only on a much larger scale. It comes with a booklet full of instructions and 20 templates for making fun shapes and words. It also has all the pegs you need, wire cutters and some wire to get you started. 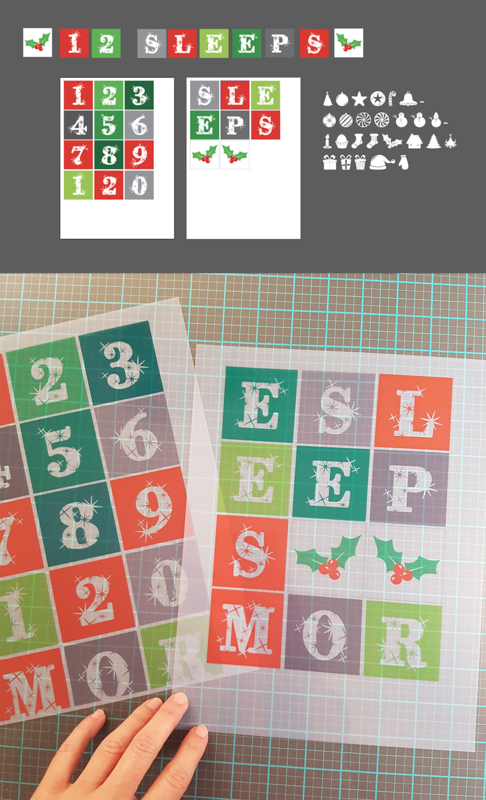 You can also use the 80+ free template available on our @werhappyjig Instagram account. I love that for a teen or tween bedroom decor or party you can create your designs with battery powered Neon Wire too! I picked up the gold hoop wreath at my local craft store, hot glued some silk flowers and greenery to it, and then I left some extra wire at each end of my word so I could wrap it around the hoop to secure it. Place a little dot of hot glue under the wrapped wire on the back of the hoop to keep it from sliding around. This project is ideal for home decor, Valentine’s Day decor, wedding decor and more. I’m so excited about the possibilities with this awesome new tool! Hello, We R friends! 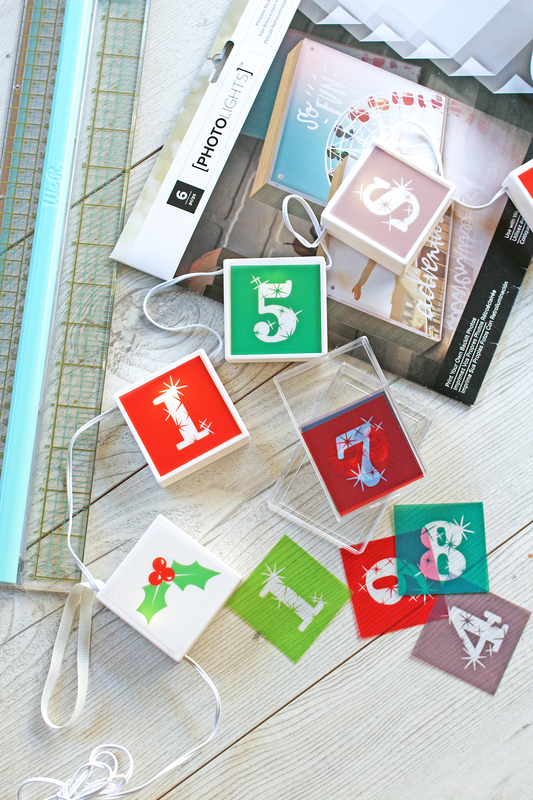 Enza here, and today I’m sharing a fun garland created with the Frame Punch Board. Every year towards the end of December, I like to put together a year-in-review type of project that is a collection of our best moments. 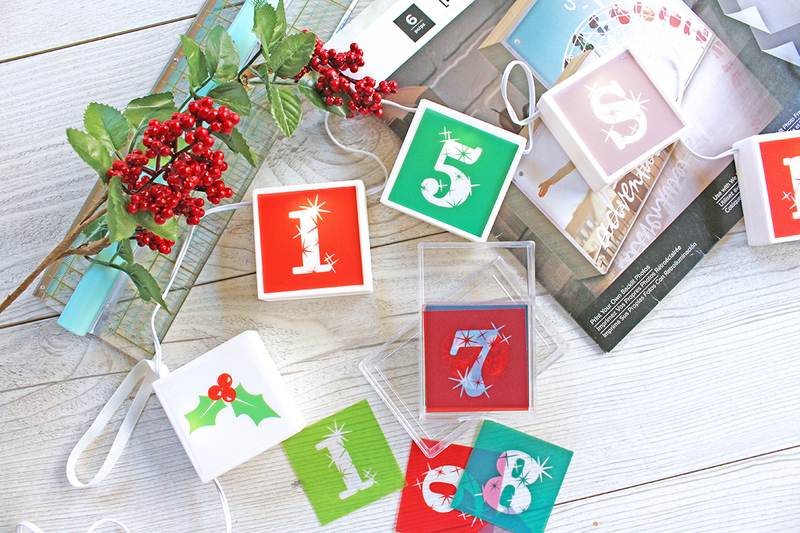 It can be a mini album, a grid layout, or a home décor piece that displays one photo per month, and gives a general idea of what our year looked like. For today’s project, I decided to go with a garland. What I like about this type of project is the flexibility of moving things around, add fun embellishments, and have the opportunity to enjoy the photos at any time. I opted to create a variety of frames in different sizes. The Frame Punch Board is super easy to use; by simply adjusting the alignment bars, you can vary the thickness of the borders. I picked the Hooray! collection by Crate Paper for the frames, and a combination of embellishments from several Maggie Holmes collections to decorate them. Some of the frames measure 3.5×4”, others 3×5”. I used foam tape to adhere my elements down, just to give them some dimension. I then traced and fussy cut the numbers for the year to thread through the first row. 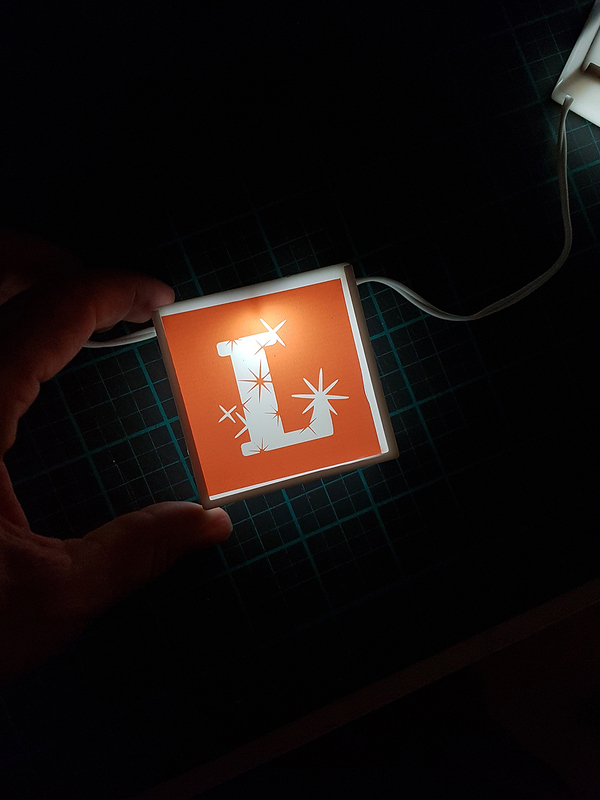 The Mini Alphabet Punch Board would work as well for this. I only have the regular size one, so the numbers were too big compared to the frames. I used white and gold twine to thread all my elements together. I love how this garland turned out. It is the perfect way to remember the past year. It would also be a great gift idea for grandparents! I know my parents would love to have photos of the kids on their wall or mantel. Hello and welcome back to the blog today! 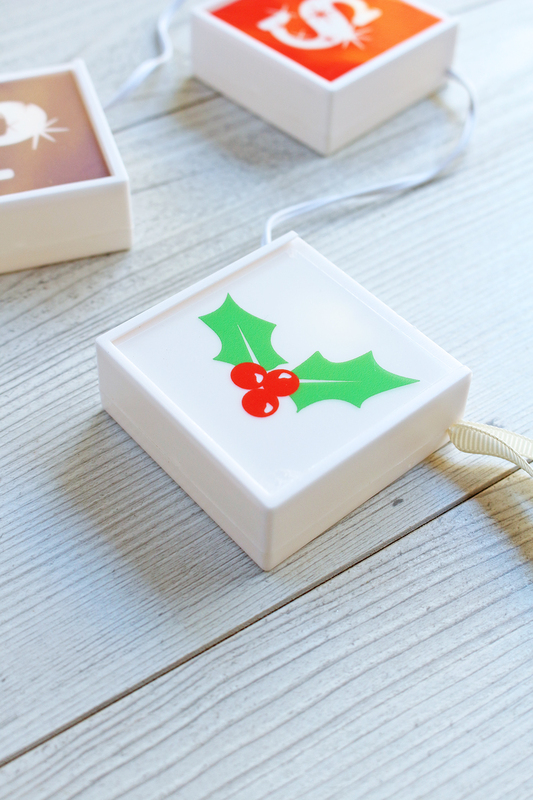 Chantalle with you, to share a sweet and simple, festive idea. 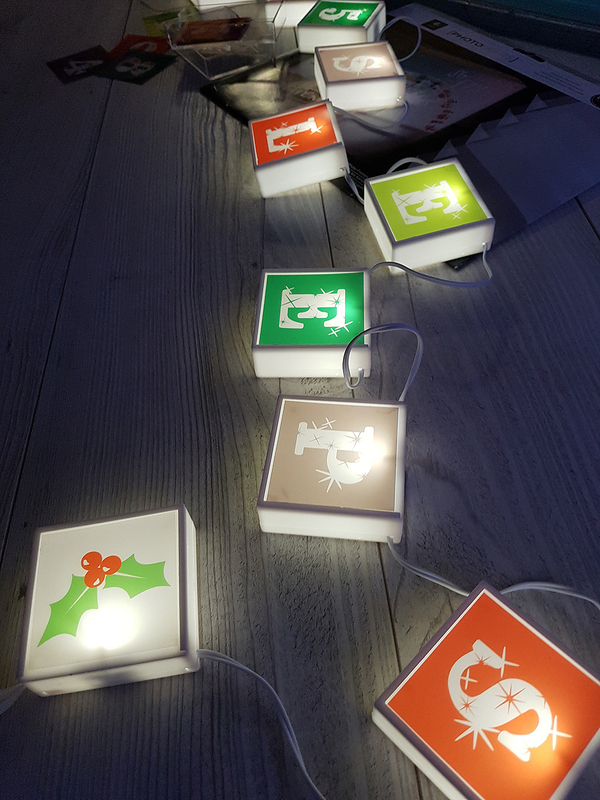 I’ve used a PhotoLights Photo Frame Strand, my computer and some PhotoLights Printable Backlit Film Paper to create a light-up countdown calendar, which will make the long wait for the jolly man in red, just a bit more fun! 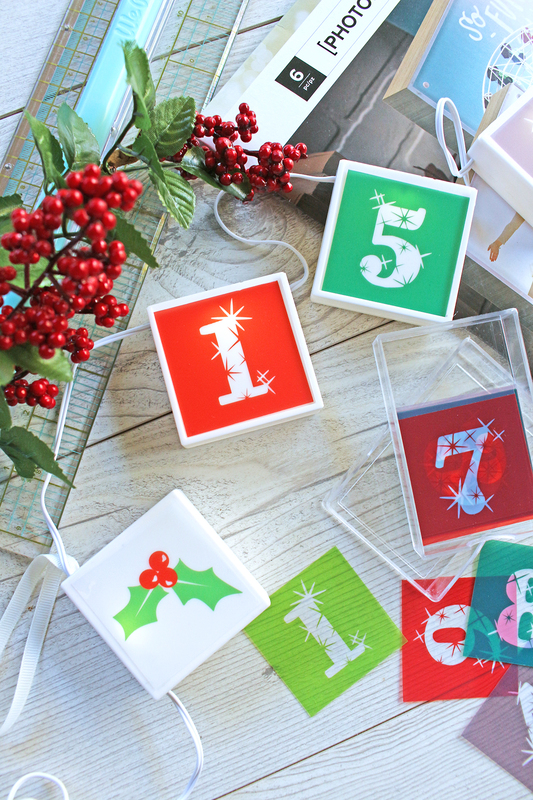 Print off numbers or phrases to switch out daily in the lead up to Christmas! 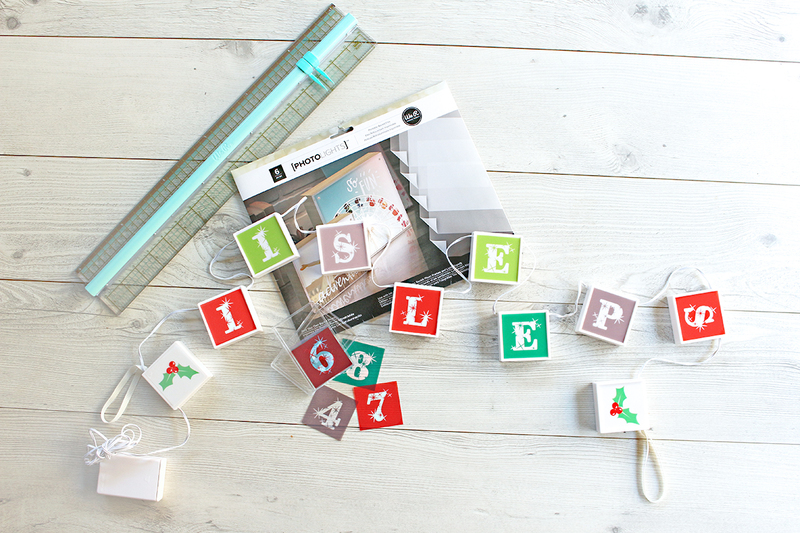 I’ve combined my numbers with the word ‘sleeps’ to let my kiddos know how many more agonizing sleeps there are to go! 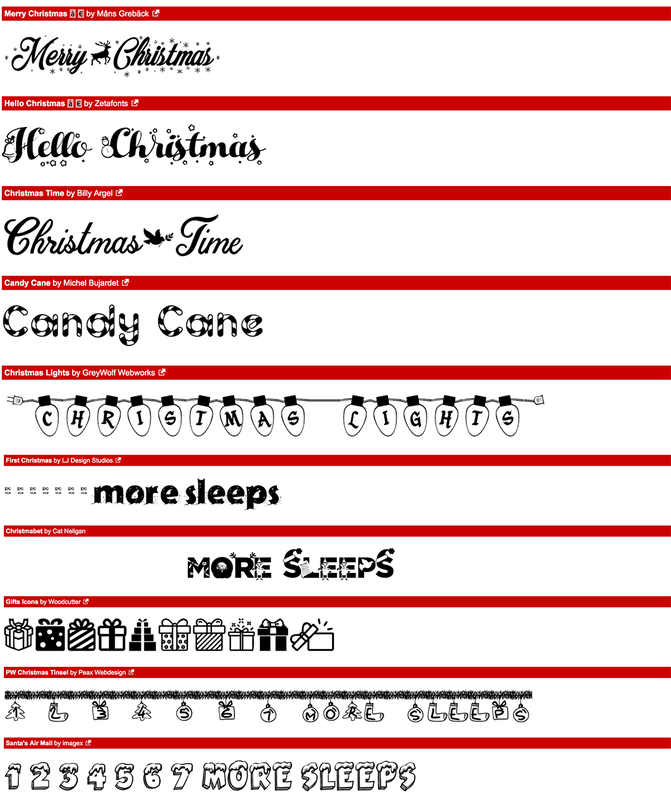 I started by heading off to a free font website like DaFont or Squirrel Fonts and checking out their festive options. There is a huge variety of scripts, ornamental and decorative typefaces to choose from! I then went about measuring the little lightboxes in the Photo Strand with my Supreme Ruler and then set some text inside coloured boxes to fit. (I have used Illustrator but you could also use any word processing programme.) I printed these boxes off onto some PhotoLights Printable Backlit Film Paper, making sure I printed on the more matte side. Note: If you print on the shinier side, the ink does not adhere to the paper. Fear not though, I made the mistake and the ink wiped off with a baby wipe. I used my Supreme Ruler again to trim up all the little films and then placed the ones I was going to be using straight away, on to the photo strand. On either end of the strand, I thought it would be cute to pop a little festive icon, like this mistletoe. The spare numbers are stored in a little acrylic box. I think this photo strand would make for a great gift. 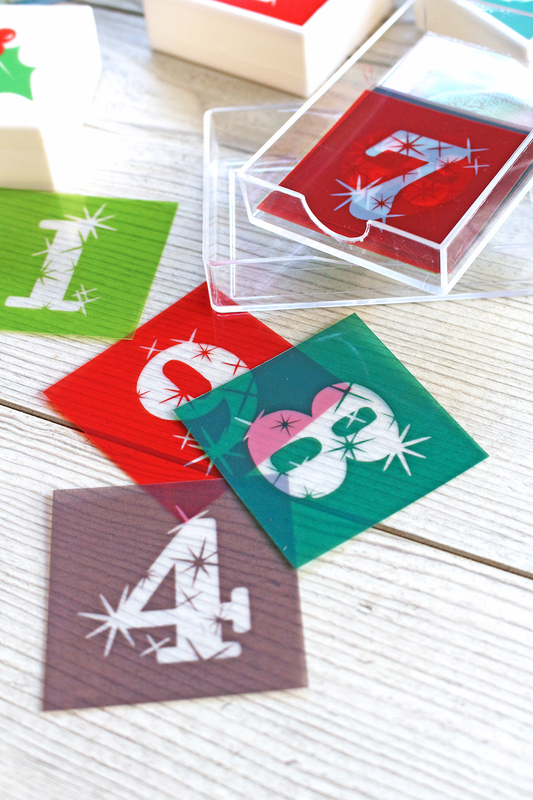 Giving the numbers all prepared in this way is super easy for the recipient to change up the message. 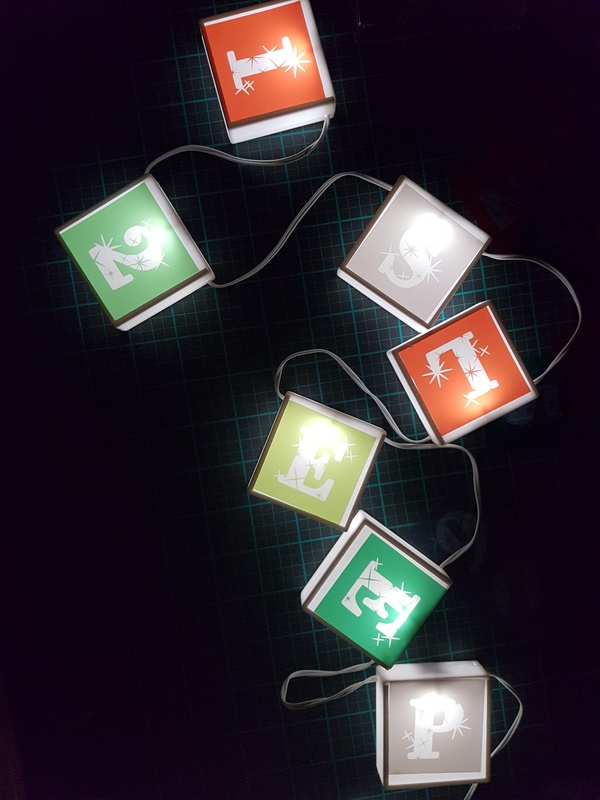 Print off multiple copies of the alphabet and you’ve got a great teacher’s gift! The Photo Strand is perfect for any number of occasions! And now let’s dim the lights please…. My calendar really comes to life when it’s switched on! 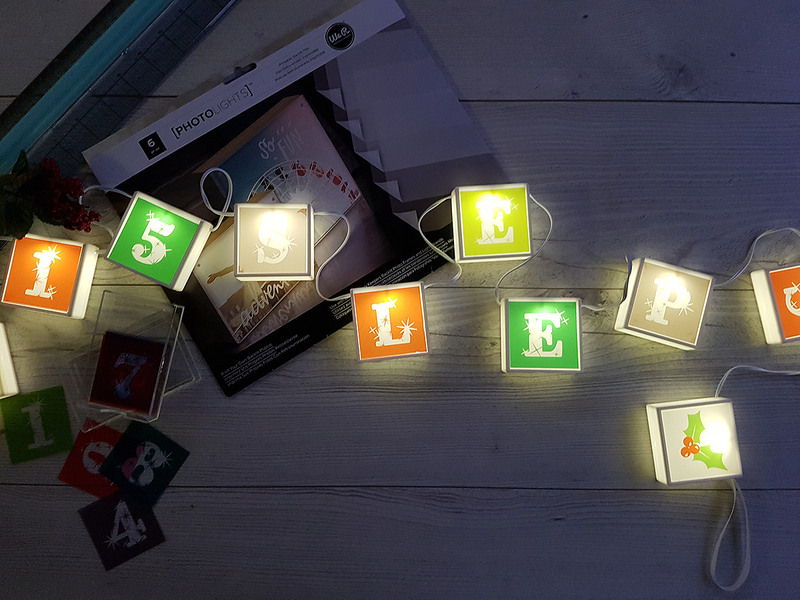 You could hang it up indoors or bring it outside for some festive cheer. The battery pack makes it fully portable.